The Vietnamese government has set a low budget deficit target for next year given Vietnam’s sinking revenues from crude oil and tariffs, with a cut in recurrent spending which will leave the country’s public investment unaffected. Last week it was announced by the government that the budget deficit in 2019 will be lower than this year (see Table 1). It will also be far lower than the average rate of more than 5 per cent recorded over previous years. According to the Ministry of Finance (MoF), it is extremely important that budget deficit be reduced in order to control the public debt, which is reducing from 62.6 per cent of GDP in 2017 to an expected 61.4 per cent of GDP this year. The ratio is expected to be 61.3 per cent of GDP next year. In order to reduce state budget deficit, the recurrent spending rate has been reduced from about 70 per cent of total budget expenditure in previous years to 64.8 per cent in 2017 and around 64.11 per cent this year. It will drop further to an expected 63.8 per cent in 2019. The low budget deficit for the next year comes amid reductions in revenue from exports, including crude oil exports, and imports under tariff cut commitments. Minister of Finance Dinh Tien Dung reported that revenue from taxes and fees is decreasing, from 20.1 per cent of GDP last year to about 19.7 per cent this year. For example, it is expected that Vietnam will export 11.76 million tonnes of crude oil this year, worth $1.56 billion, down from last year’s 13.28 million tonnes worth $1.89 billion. It is forecast that Vietnam will export 10.43 million tonnes next year. If oil price hovers at about $70 per barrel, total revenue from crude oil exports will be $730.1 million. Also in 2019, the state’s tax-based revenue from exports and imports is projected to be $7.78 billion, down from this year’s $7.83 billion. This reduction is due to tariff slashes under free trade agreements (FTAs) involving Vietnam. 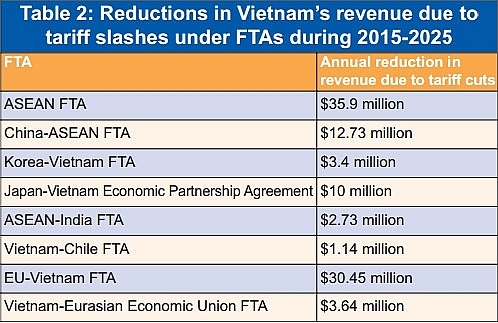 According to the World Bank, during 2015-2025, Vietnam will directly see a slump in import tariff revenue from $1.43 billion to $477.3 million, due to import tariff cuts under FTAs (see Table 2). Also, the indirect reduction in import tax revenue from FTAs during 2016-2025 will be $5.96 billion, with an average $591 million each year. Efforts by the Vietnamese government to reduce the budget deficit have received applause from the Asian Development Bank (ADB). Nguyen Minh Cuong, principal country economist from the ADB, told VIR that the government’s fiscal consolidation programme has made progress in the first half of the year. Budget revenue increased by 15.7 per cent in the first six months, reaching 28.7 per cent of the GDP. Meanwhile, expenditure increased by about 11.4 per cent, thanks partly to the spending rationalisation, though still lower than formerly planned. The budget posted a small surplus equal to 0.1 per cent of GDP in the first half of the year, making a deficit of nearly 1 per cent a year earlier. “Efforts to rein in the fiscal deficit helped to lower the public debt’s ratio to the GDP to an estimated 58.5 per cent by the end of June 2018, from 63.7 per cent at the beginning of 2017,” Cuong said. “It is expected that the public debt-to-GDP ratio will be 61.4 per cent this year, lower than the 63 per cent last year. This is quite an impressive achievement by the government,” he added. According to the World Bank, Vietnam’s fiscal consolidation is expected to contain its public debt during 2018-2020.